From the past three articles, we have already established that social entrepreneurs face a specific set of challenges, including, but not limited to, finding funding, knowledge and consulting opportunities. What we haven’t looked into so far is their need for community. While social entrepreneurship and other impact-oriented forms of work have been gaining traction over the past decade, this movement still largely consists of young and first time entrepreneurs. Especially for these rather inexperienced changemakers, knowing that someone out there has been through similar issues and challenges and made similar mistakes, can be a huge factor. Being able to actively count on the support of peers to actually solve problems at hand can be a real game changer. Being part of a community, thus, is not a “nice to have” – but rather a fundamental success factor. In this article, we set out to highlight the main ways to join a community for social entrepreneurs in Germany – from platforms and meetups to networks and hubs. We were able to identify three preferred ways of finding a community: in co-working spaces, knowledge & innovation communities and at meetups. While none of the meetups particularly stand out (see our top choices below), what does stand out is the abundance of them in major German cities – many of them have hundreds of subscribers and topics ranging from purpose economy and female empowerment to tech for good. Munich and Berlin are the two hotspots for social entrepreneurship in Germany: the Social Impact Akademie, Impact Hub, the Investment Ready Program, Social Impact Labs, and various conferences are just a few examples of what is offered in these two cities. As exciting as the scene is, especially in Berlin, it is obvious that in the rest of Germany there is a lot less to be found, especially outside of the metropolitan areas. Once again, with the sole exception of knowledge provision, we noticed how governmental presence in this sector is quite scarce. The vast majority of the programs are still carried out by private entities. Even if individual programs sometimes display the logos of their local municipality or one of the German ministries, it is often unclear in which way these collaborations actually take place. Ashoka. A global network for creators of our society who, with an entrepreneurial attitude and innovative approaches, try to solve social problems – in partnership with institutions and committed people worldwide. Ashoka played a fundamental role over the past two decades in pushing the agenda of social entrepreneurship in Germany and is therefore recognized as one of its key players. SEND. 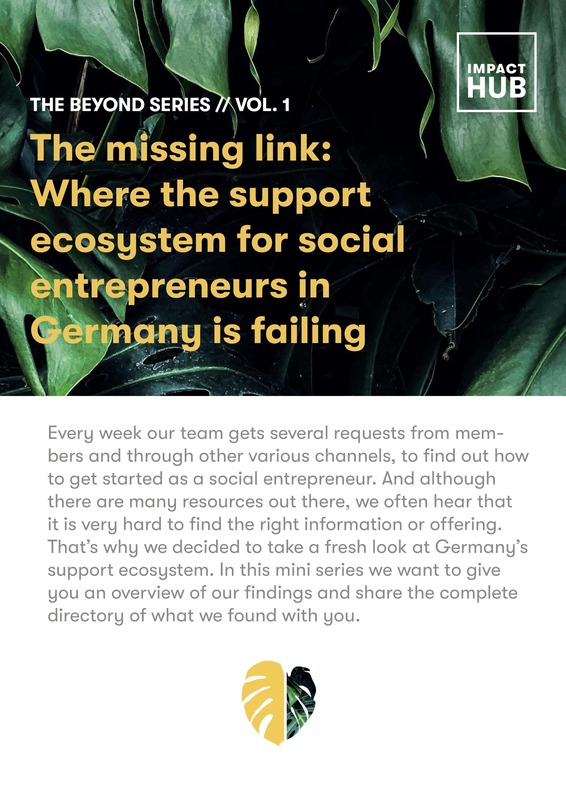 The Network for Social Entrepreneurs and social startups in Germany, SEND e.v., promotes the visibility of social entrepreneurs* and their solutions to the public. Having been part of Bundesverband Deutsche Startups e.V., it was founded as an organization in its own right in 2017. Impact Hub. As the largest network of social innovators worldwide founded 2005 in London, Impact Hub focuses on building entrepreneurial communities for impact at scale. Impact Hubs around the world are home to the innovators, the dreamers and the entrepreneurs who are creating tangible solutions to the world’s most pressing issues. In Germany there are Impact Hubs in Berlin, Munich, Dresden and the Ruhr Area. Overall, Germany seems well, but not great when it comes to the topic of Community. While the networks may seem hustling & bustling in the major cities, everything further away is rather silent – and even within the bigger cities, it is still hardly possible to satisfy the very diverse needs of social entrepreneurs. However, this is a topic that could move forward quickly: According to the Global Impact Report 2018 – which surveyed social entrepreneurs from 71 Impact Hubs around the globe – 84% had the most urgent need to “feel part of a larger community and network”. This is a higher number than the need for funding (45%), and the need for skill development (70%). We can imagine that private entities that have been trying to satisfy this desire for community, will step up their game – and new organizations will try to thicken the web. When it comes to social entrepreneurship and getting your sustainable business started, funding is, of course, one of the main concerns. In 2017 the international Impact Hub network (15.000 members in over 100 countries) conducted a Global Members Survey enquiring after the support needs of social entrepreneurs: unsurprisingly, it turned out that 45% of the Members “sought support in obtaining financial capital and investment” (Global Impact Report 2018).